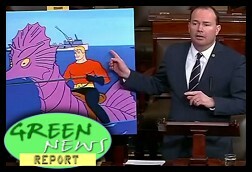 " Articles in Category: Mike Lee	"
The madness of King Donald continues to devolve at now breakneck speeds, as the White House and an increasingly enraged Trump continue their unsustainable spinning, flip-flopping and nonsensical rants concerning the President's sudden firing of the FBI Director earlier this week under an obviously phony pretext. The need to create fresh lies to cover up older ones is also creating fresh perils for those foolish enough to enter Trump's orbit, like Deputy Attorney General Rod Rosenstein. 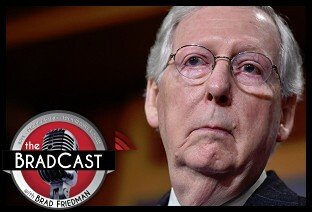 So, we've got the latest on all of that, including an interesting suggestion for Comey's permanent replacement, a bit of pushback from his Acting replacement, and some ill-considered admissions about the entire affair by Trump himself. Meanwhile, as Trump keeps digging, and the media and Congress continue (justifiably) to obsess about and investigate it all, the Administration's other corrupt policy measures move forward with measurably less attention. Among those efforts is the unprecedented attempt to roll back National Monument designations by the three previous Presidents, including the Obama-designated Bears Ears National Monument in southern Utah. In response to an Executive Order signed in April, U.S. Interior Secretary Ryan Zinke is touring the area this week, where more than 1 million acres of land that is sacred to Native Americans and home to tens of thousands of archaeological sites, including ancient cliff dwellings, are now being reviewed on behalf of Trump, Congressional Republicans and corporate fossil fuel interests. Joining us today to describe the local, tribal efforts to protect these native public lands --- and the Utah Congressional delegation's efforts to undermine them (literally) --- are Carleton Bowekaty, a Zuni Tribal councilman and co-chair of the Bears Ears Inter-Tribal Coalition, and Matthew Campbell, attorney with the Native American Rights Fund. 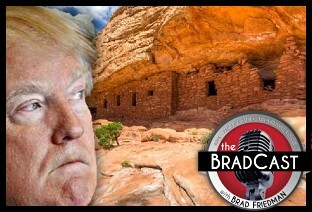 They both explain the reasons why the Antiquities Act of 1906 was invoked by President Obama to protect the lands; speak to some recent "extremely offensive" comments by Sen. Orrin Hatch (R-UT); and the absurdity of Trump describing these designation of federal lands as national monuments as "federal land grabs".